Designed by the POS experts for PC Kiosk professionals, the QT-8000 is virtually the ultimate solution for any kiosk application. The QT-8000 includes Microsoft WE-POS (Windows Embedded for Point of Service). Some of the WE-POS benefits are: The first POS Operating system to provide plug-n-play peripheral support. It empowers retailers to create the most compelling customer interactions by providing a standard, retail optimized platform for standard retail applications and peripherals and it decreases OS and application development costs. 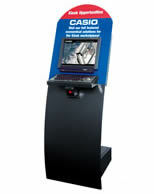 Casio offers a centrally managed kiosk solution at a very favorable price point that no other competitor can match, creating entirely new markets for self-service, Product Information, and many other applications. Casio offers the industry’s leading Administration Tools providing control, reporting, and menu/pricing changes within seconds. It is a tightly integrated solution, including online ordering and digital signage. Since the ATM revolutionized banking in the 80’s, the U. S. has experienced a consistent cultural trend toward self-service. Imagine life without pay at the pump, self-service airline check-in, or self-service check out at home repair centers and major grocery store chains. Kiosk for Restaurants, Express Check-in, Product Information etc. Self Ordering & Line Busting – kiosks virtually eliminate lines and move personnel to order fulfillment. Increased Revenue – kiosks consistently outperform cashiers at suggestive up selling. Multilingual User Interfaces – imagine a team of virtual cashiers that all speak multiple languages. Increased Promotion – kiosks provide a multimedia canvas for promotional material. Lowered Theft and Absenteeism – kiosks eliminate employee theft and staffing issues. This page is part of GeneralManual.Com Network Casio QT-8000Spector Point of Sale Cash Register User Manual.